I’ve got to get my life under control. So much to do, so little time. I’ve tried lots of different ways to track to-dos, but none of them really stuck before I started using Cultured Code’s $10 Things. So Much To Do, So Little Time: Things lets you see all the items you have on your plate on a given day, as well as what’s looming in the days to come. Things looks like, well, a to-do list. 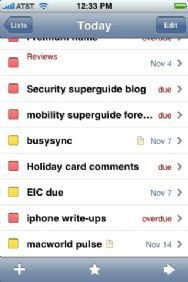 You can create items, add notes to them, set due dates, and assign them to categories and projects. When you’re done with an item, press the colored box next to that item and you get the satisfaction of seeing a check mark next to it. What more could you ask for? One of my favorite features of Things is its understanding of items you’re just not going to get to today. Tap on an item and choose Don’t Show In Today, and it will disappear—until tomorrow. It’s a great way to focus. You can also assign to-dos to projects and then drill down to see what’s required of you in a specific area. And for all those tasks you just know you need to do sometime, when you’re good and ready, there’s the Someday pile. It’s a great place to file things for a rainy day. The killer feature that ticks Things over into the category of awesome iPhone software is its integration with the Mac version of Things, currently in beta but expected to be released in January for $49. We’ll hold off on reviewing the Mac version of Things until it ships, but the important thing to know is that the two versions work well together, providing a unified way to interact with your to-do items on the desktop and the phone. The two programs sync via Wi-Fi, and the syncing couldn’t be easier. After you identify your iPhone from within the desktop app’s preferences, the two programs automatically sync whenever the Things iPhone app is open. If Things sounds simple, that’s because it is. Other to-do list managers I’ve tried have, quite honestly, gotten in the way of me getting things done. Things doesn’t do that. And I wouldn’t have it any other way. Now if you'll excuse me, I've got to open up Things, check the box next to "review Things for iPhone," and move on to my next task. Things is compatible with any iPhone or iPod touch running the iPhone 2.x software update.